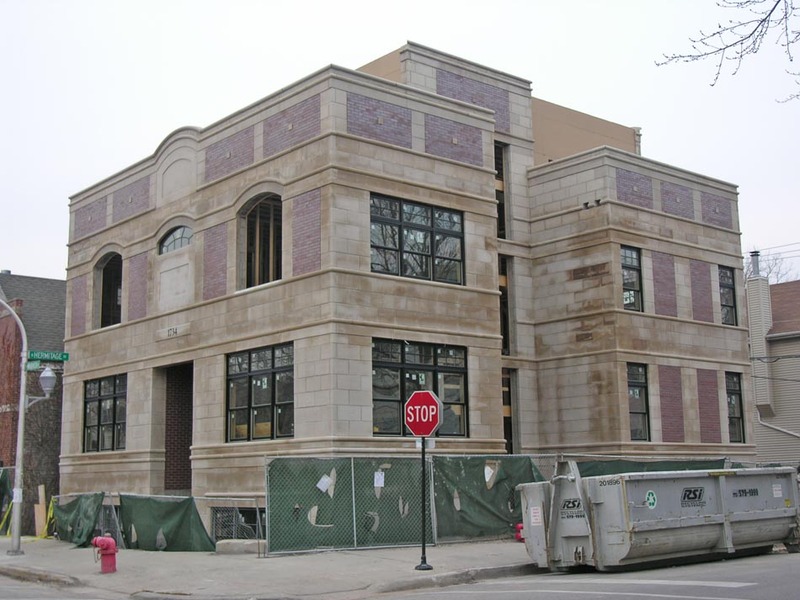 Here’s a look at the Goliath that’s being built over the rubble of the elegant, turn-of-the-century Queen Anne-style building that used to sit at 1734 W Wabansia Ave in Bucktown. Earlier this year, Preservation Chicago collected several thousand signatures, mostly from neighborhood residents, in a bid to save the building, which for 21 years housed the beloved Artful Dodger pub. 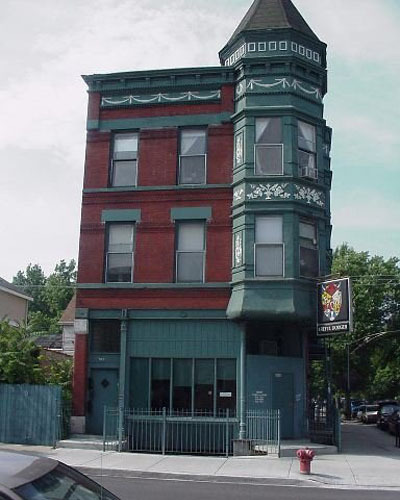 It spent several months on the City’s Demolition Delay List but eventually fell, with Alderman Ted Matlak (32nd) citing reduced density, added parking and elimination of a corner tavern as his reasons for supporting the demolition. Original plans called for two single-family homes to be built on the site, but only one building– which, judging by the sheer mass of it, must be multi-unit– is going up. We haven’t seen any marketing for it– does anyone else have more information? And, more importantly, what would Dickens make of all this? Dickens would have tried to turn a buck out of serializing it to a magazine. You can’t blame a guy for wanting to make a quick pound, can you Joe Z? Most artists die broke or forgotten, and usually both. Dickens had the good fortune to be admired in his time. what is going on with that concrete block? is it rusting??? all the reasons to keep the existing not get rid of it. The city needs more density, less (need for) parking and more corner bars. I was admiring, not blaming. Dickens is a great favorite of mine! There are 5,000 more just like this once cookie-cutter corner scattered throughout Chicago. Make that 4,999 and counting just like it. Is “eliminating a corner tavern” a goal of the city? I know the emergence of the mega-bars serving the post college, and wish they were still post college, seems like a goal of the city. When did these Big Ten going Mid-West hicks take over the bar scene anyway? The north side looks like a freakin’ frat row on the weekends. BTW… save some trees people… that building was ugly and poorly designed. The classic corner tavern scene’s been dying a slow death for a long time, and not just on the north side. OK, I have mixed feelings here– I live four blocks away. On one hand, The Artful Dodger was a great place to go, BUT the building was wreck. It had not been kept up at all and really needed a lot of work. Second, like some other corner bars (LOTTIES– I’m looking at you), the Dodger took up a lot of parking. There’s nothing like realizing that a third of the parking spaces clear out after the bars close, and you know most of the people driving home are blitzed. Like it or not, that area of Bucktown is getting pretty fancy. It should be OK to say that an area can outgrow the need for a punk-rock/hipster dive bar. And for those who want to support places like that, you can still go to Danny’s or The Charleston. Or, if you’re really interested in “historic” Bucktown tavers, go to the Lincoln Tavern. It’s been there since Prohibition was repealed. What you CAN’T do, however, is expect Bucktown to freeze in place. Bucktown is done and has been done for years. The Artful Dodger wasn’t exactly hipster central as of late, either. I disagree with the statement on parking. These bars were neighborhood places. People did not drive in to go. They usually walked. It’s not a question of freezing the neighborhood in time, or keeping the bar, it’s a question of the Alderman (Matlak) giving his blessing to see a historically designated building torn down and replaced with a cookie-cutter building – against the wishes of his constituents. He’s going down, check out http://www.scottforchicago.com, the candidate, Scott Waguespack, ran the campaign that ousted Berwyn’s corrupt regime a year or so ago.